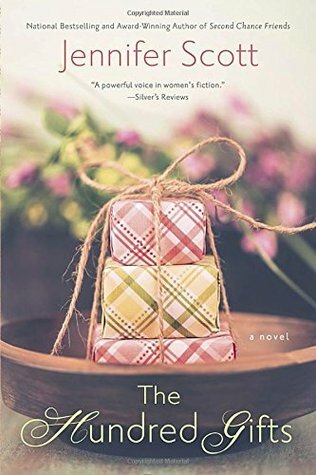 Laurie Here - Contemporary Fiction and MORE - Book Reviews: #REVIEW #GIVEAWAY AND #BLOGTOUR "The Hundred Gifts" by Jennifer Scott! #REVIEW #GIVEAWAY AND #BLOGTOUR "The Hundred Gifts" by Jennifer Scott! Jennifer Scott, the author of The Sister Season, The Accidental Book Club, and Second Chance Friends returns with her particular brand of women’s fiction, this time centered on a holiday theme with THE HUNDRED GIFTS (NAL Accent; October 27, 2015), again tackling deep and complicated issues of love, loss, family, and friendship. A touching story that arrives just in time for the end of the year, a time of reflection as we prepare for the new year ahead, THE HUNDRED GIFTS captures the true spirit of the holiday season. Wow! I could relate to a lot in this book! The age of the main character, Bren. I could relate to everything about her and how she felt about her kids, and how her kids made her feel, her husband, and I could go on and on. Being the same age and being able to relate to the character so well, well . . . I enjoyed this one. So the Christmas bomb was dropped on her, literally, even though her daughter continually invited her to Thailand. She was afraid one day her daughter would have little Thailand-babies and they’d be running around. Bren’s heart was not in Thailand for Christmas, even though her two kids finally caught up with each other over in Asia, they at least would be together. She felt jealousy, as I know I would, and I’m sure that will happen to me one day, so it was a little refreshing reading about that in this book. It was kind of a preparation for it. Bren’s neighbor, Virginia Mash (Smash!) starts giving the cooking class problems. It’s too loud. It smells. She sees smoke rising into her apartment. (UGH!) It’s this, it’s that, so the cooking class, instead of breaking up, decides to shower this woman with gifts! I don’t want to get much more detailed than that so you can enjoy it! You’ll love this! There is the part where they cook Turduckens. That part is hilarious! There are some parts you can’t help but to laugh your behind off! Turducken? I don’t know what it is, either! I know I saw an ad for it on TV at KFC or Burger King one time? I can’t remember! LOL! The ladies were making shapes out of them, etc! It was just too funny! These are just everyday ladies trying to get by with their families, friends, and the new things that make them happy now that they are empty-nesters. That really does take a toll on you, as they all learn together. The perfect sentimental book for this time off year. This book was provided to me by the Publisher through NetGalley. CONVERSATION GUIDE INCLUDED - You'll LOVE this! It really gets you thinking about the book and what happens! For the Giveaway, please fill out this form! You will need to use the scroll bar to the right of the form to move it around to fill out the questions. Thanks!